In case you missed it, Season One of Lemony Snicket’s A Series of Unfortunate Events dropped on Netflix. The story plays so well over the eight episodes that it may as well have been custom-written for the network. Add it to your queue and thank me later. 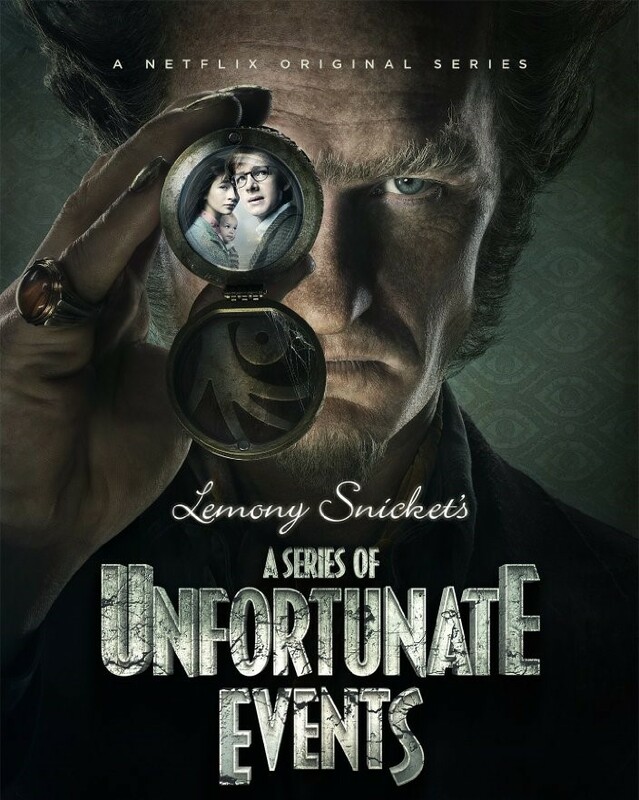 Season One of Lemony Snicket’s A Series of Unfortunate Events (produced by Netflix in association with Paramount Television) weaves together the first four books. Events happen in a different order, which threw me at first, but it ends up staying true to the original tone and story. That’s partly due to Lemony Snicket himself (AKA Daniel Handler, the author) doing double duty as an executive producer and writer. His distinctive style runs throughout the series. That speaks well for the writing team who were able to create such a consistent voice. For the uninitiated, A Series of Unfortunate Events follows the three Baudelaire children: Violet the inventor, Klaus the book lover, and Sunny the very toothy baby. The children are orphaned right off the bat and sent to live with their closest living relative. That turns out to be Count Olaf, an actor and “occasional consultant” who clearly, unabashedly only cares about their fortune. You may have guessed from the title that things don’t go so well for the kids. Lemony Snicket (played on screen by Patrick Warburton) walks through the background of the story, unseen by the characters as he narrates for the audience. What I love about this show is how it manages to be interesting to both kids and child-free adults despite being based on a children’s book series. I watched with my other half, a guy who doesn’t read young adult fiction (aside from comics). It held his attention all the way through. The writing is enormously clever, the acting hits all the right notes, and the visuals went way beyond what I expect from a TV show. It’s also paced exactly right for this length of season. Speaking of pacing, I hope the next season (we’re getting at least one more) runs eight episodes like this one. Some of the 13-episode Netflix runs seem to sag in the middle while waiting for the second wave of action. A Series of Unfortunate Events stays focused on the story but doesn’t feel rushed. The way the children are handled is a huge mark in Netflix’s favor. In the 2004 Jim Carrey movie, Violet was weirdly stripped of her inventive mind with no reasonable explanation. She was just a pretty, plucky girl with all her brilliance given to Klaus. Though the movie wasn’t terrible, that ridiculous change (as well as an overall campier tone) disappointed some fans of the original books. There’s none of that nonsense here. The siblings have the close, interactive relationship of equals that was such a memorable part of the books. Violet and Klaus consult each other with affectionate sincerity on everything from shorefront experiments to cooking dinner. Even Sunny contributes garbled commentary and the occasional toothy assist. There is no “I’m the boy so I have to be the problem solver” or “I’m the girl so I guess I’m cooking”. Violet does carry Sunny most of the time, but that seems more because she’s older and stronger than out of a gender role situation. The kids who play the Baudelaire siblings (Malina Weissman, Louis Hynes, and Presley Smith) turn in performances that actors twenty years older would envy. Seriously, even the baby, who is basically just chewing on things and looking alert. I can’t get into a kid-centric story where the child actor doesn’t put in the effort to embrace their characters, so I really appreciate the work here. These young actors are going places. Big places. A-list places. A Series of Unfortunate Events is a show for people who like clever dialogue. It’s a show for people who like good storytelling. It’s a show for people who like masterful acting and solid camera work and great sets. Bottom line: Lemony Snicket’s A Series of Unfortunate Events should be the next thing in your Netflix queue. Am I the only one who’s marathoned A Series of Unfortunate Events so far? How do you think it stacks up against the 2004 movie? Share your opinion in the comments section below, and watch for our “spoilers” review of the whole series in a week! Previous:2D Puzzle Platformer BOOR Gets 14 February 2017 Steam Release Date!